As reported by Marie-Maude Denis and Jacques Taschereau of CBC News, contaminated soil generated from the development of properties in Montreal is ending up on prime agriculture land. Radio-Canada’s investigative program Enquête recently tracked demolition waste from Montreal sites to farmland in Saint-Rémi. When the investigators confronted the farmer, he claimed the material dumped on his property would be used as a foundation for a greenhouse and that it was legal. An environmental lawyer contacted by the Radio Canada investigators disagreed with the farmer as did Quebec’s Environment Ministry. The Environment Ministry confirmed it found contaminated soil at the site last year, but it’s offered no further details about its origin, saying the matter is still under investigation. When The Radio Canada investigators questioned the general contractor working on the site that was the source of the contaminated soil, he claimed the a subcontractor properly trucked the soil away. 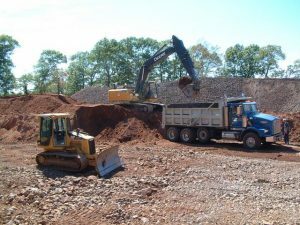 The claim of the general contractor and farmer is that the material is construction debris consisting mainly of bricks and stones and not contaminated soil. The investigators noted that the material they saw dumped on the farm included metal and concrete. According to the Environment Ministry, the kind of debris that was tracked by the investigators can’t be legally be use for the intended farmland construction. In a similar investigation conducted by Radio Canada in 2016, investigative reporters followed trucks and observed debris being dumped in the countryside. The investigators arranged for the sampling and analysis of the soil from several farms and that found some samples to be contaminated. As reported by the CBC News and the Montreal Gazette, the Province of Quebec and the City of Montreal are joining forces to try to crack down on a possible link between organized crime and the dumping of contaminated soil on agricultural land. The solution? A GPS system that can track where toxic soil is — and isn’t — being dumped. 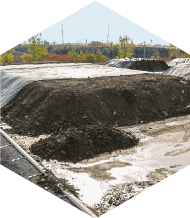 According to the province, there are about two million metric tonnes of contaminated soil to be disposed of every year. Toxic soil is supposed to be dumped on designated sites at treatment centres. But the Sûreté du Québec has confirmed it believes members of organized crime have been dumping soil from contaminated excavation sites onto farmland. Quebec Provincial police confirm they are investigating a possible link between organized crime and the dumping of contaminated soil. “It’s a constant battle. The city and all municipalities have to be very vigilant about any types of possible corruption,” said Montreal Mayor Valérie Plante. The new pilot project, called Traces Québec, is set to launch in May. Companies would have to register for the web platform, which can track in real time where soil is being transported — from the time it leaves a contaminated site to the time it’s disposed of. Some environmentalists say they’re concerned about the impact the toxic soil has had on agricultural land where it’s been dumped. They’re also uncertain about how a computerized tracking system will put an end to corruption and collusion. “Right now, there’s no environmental police force in Quebec so there have been investigations into these toxic soils being dumped but unfortunately nobody’s been held accountable yet,” said Alex Tyrrell, leader of the Quebec Green Party. The city and the province say this is a first step at addressing the issue and more announcements will be on the way in the coming months. The pilot project — a joint effort with the city of Montreal — will test a system, known as Traces Québec, that uses GPS and other technologies to track contaminated soil. The first test case will involve a city plan to turn a former municipal yard in Outremont into a 1.7-hectare park. Work is to start in the fall. All bidders on the project will have to agree to use the Traces Québec system. Using the system, an official cargo document is created that includes the soil’s origin and destination and its level of contamination. Trucks are equipped with GPS chips that allow officials to trace the route from pickup to drop-off. She said she wants to protect construction workers and residents by ensuring contaminated soil is disposed of properly. The city also wants to make sure the money it spends on decontamination is going to companies that disposed of soil safely and legally. Plante said Montreal will study the results of the pilot project before deciding whether to make the system mandatory on all city projects. 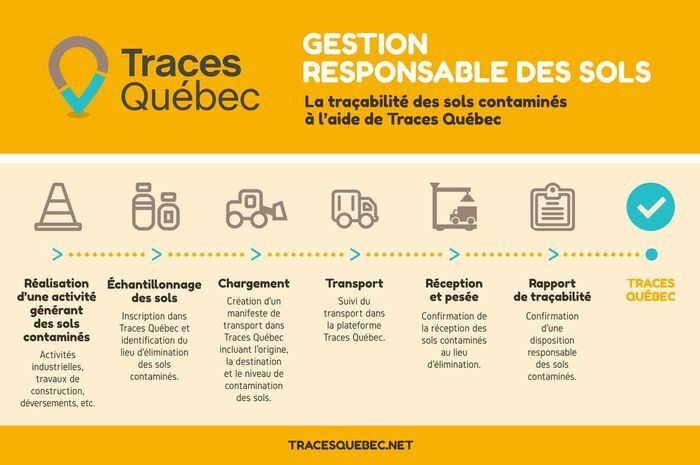 The Traces Québec system was developed by Réseau Environnement, a non-profit group that represents 2,700 environmental experts. Pierre Lacroix, president of the group, said today some scofflaws dispose of contaminated soil illegally at a very low cost by producing false documents and colluding with other companies to circumvent laws. He said the Traces Québec system was tested on a few construction sites to ensure it is robust and can’t be circumvented. “We will have the truck’s licence plate number, there will be GPS tracking, trucks will be weighed,” Lacroix said. But he noted that “at the moment, it’s anything goes, there are no controls. Technology today can help take big, big, big steps” toward thwarting criminals.